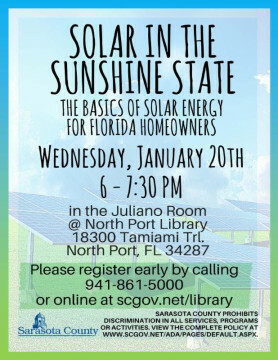 People interested in learning more about how to harness the power of solar energy for their homes are encouraged to attend Solar in the Sunshine State: The Basics of Solar Energy for Florida Homeowners on Jan. 20 at the North Port Public Library, Sarasota County has announced. A facilitator from the county’s Sustainability office will present this free program so participants can gain an understanding of what it takes to add residential solar hot water and photovoltaic technologies to their houses, a news release says. The program will cover the basics of how the technology works, along with how to calculate the return on investment and possible incentives that might help pay for it, the release adds. The presentation is scheduled from 6 to 7:30 p.m. on Wednesday, Jan. 20, in the Juliano Room of the library, which is located at 13800 Tamiami Trail in North Port. Participants are asked to pre-register online at www.scgov.net/library or by phone at 861-5000.